Following extensive renovations and remodelling, the Savoy Theatre was reopened in October 1929 with the triumphant return of the D'Oyly Carte Opera Co. to its London 'home' after twenty years - having last played there in 1909. Opening with a performance of The Gondoliers on 21st October, 1929, the season continued until 22nd March, 1930 and featured the return of Derek Oldham to the company with his wife, musical comedy soprano Winnie Melville, making her first appearance in G & S. Nellie Briercliffe also returned as a guest during the season together with Leo Sheffield, who alternated in some off his old parts with his successor Sydney Granville. Although Granville had made his début in most of the 'Pooh-Bah' roles whilst touring Australia with the J. C. Williamson Gilbert & Sullivan Opera Co. in 1926, (see article), and had succeeded Sheffield upon his return to the D'Oyly Carte in 1928, this was the first time that London audiences had seen him play the roles since the company's return from its Canadian and North American tour. From left to right:— Nellie Briercliffe, Sydney Granville, Henry Lytton, Darrell Fancourt and Berth Lewis pictured in 1929. In early 1930, the B.B.C. was permitted to transmit excerpts from three operas performed during the season live from the theatre for the first time since its Mikado broadcast of 1926. The first broadcast in late January was, again, of The Mikado, while excerpts from Iolanthe followed on 22nd February and The Yeomen of the Guard on 15th March. 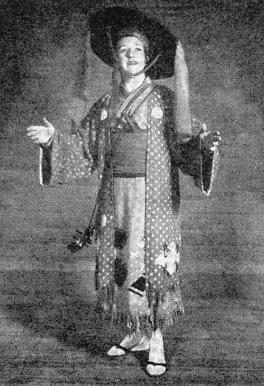 "Tonight at 8.15 excerpts from Mr. Rupert D'Oyly Carte's production of The Mikado will be relayed from the Savoy Theatre and broadcast from 2LO, 5XX, and other stations. The performance will be conducted by Dr. Malcolm Sargent and the cast will include Mr. Derek Oldham, Mr. Leslie Rands, Mr. H. A. Lytton, Mr. Sydney Granville, Miss Winnie Melville, Miss Beatrice Elburn and Miss Nellie Briercliffe." 10.12 [PM]:— Second excerpt from The Mikado, with Darrell Fancourt and Bertha Lewis. 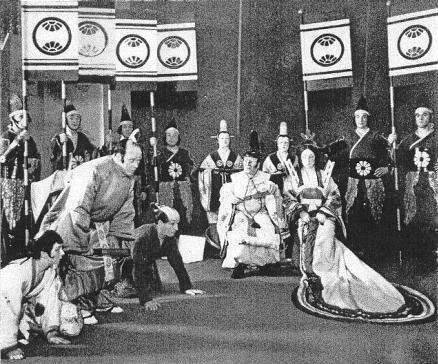 Thus the second broadcast excerpt was evidentally timed to begin with the Second Act entrance of the Mikado with Katisha and continued through to the opera's finale. 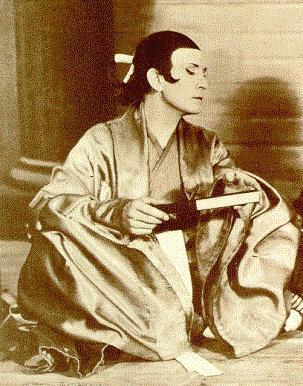 "On vase and jar, on screen and fan" — the Japanese gentlemen of The Mikado have never seemed so palpably to belong there as when wearing Mr. Charles Ricketts's magnificent dresses and outlined against his loverly scenery, and that despite the disconcertingly Early Victorian air of the male chorus with their pendulous whiskers. At last they are authentically ancient Japanese, and to our notions all the more completely incredible. To look at the sketches was to feel a fear that with these sweeping trains, these great hats and head-dresses, the lively creatures might be reduced to hieratic immobility; but, in fact, it hardly happens, unless in the case of Mr. Sydney Granville's Pooh-Bah, who, swathed in sacerdotal cloth of gold, seems to be Archbishop of Titipu to the exclusion of his other functions, and to be addressing us from the pulpit all the time. After the sublime sneer of Rutland Barrington's Pooh-Bah and the pawky mellowness of old Fred Billington's, this solemn creature daunts us. 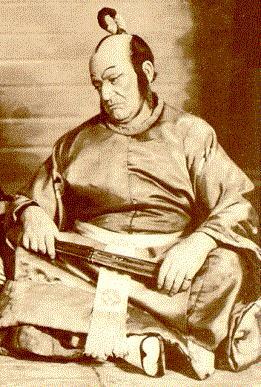 But he does not daunt Mr. Darrell Fancourt's Mikado, a trifle too noisely goblinesque, nor Mr. Lytton, whose classical Ko-Ko has never been more sprightly and mischievious. It is a great quality in his reading, that he makes us realize the cheap tailor all through, no matter how grim the executioner's panoply they put upon him. And the Three Little Maids? Well; the more artificial they are made by their flowered hats, plastered-down curls, and trailing gowns the more deliciously provocative they seem. Miss Winnie Melville has the very part for her arch graces in Yum-Yum, and sings "The Sun and I" with dainty charm, while Miss Nellie Briercliffe gets all the pertness that can be got out of her quaint costume as the wicked Pitti-Sing. Decidedly the splendours of this production do not cramp anybody's style. In fact they act as a tonic on Katisha. But does not Miss Bertha Lewis carry the rejuvenation of Gilbert's types of elderly ugliness rather far? When Katisha, dark-locked and blooming, becomes the most attractive-looking woman on the stage, the balance is really upset, however agreeable the result. Musically this is one of the best of the present revivals. The chorus, both male and female, is in admirable form and blessedly articulate, and while Mr. Derek Oldham is as attractive as Nanki-Poo in song as he undoubtedly is in appearance with his graceful blue draperies, Mr. Leslie Rands makes the best Pish-Tush we can remember for a very long time. Every syllable of the "exposition" song at the opening of the opera comes clearly and effortlessly to the ears of the whole house, and his part in the trio, "To sit in solemn silence," was phrased with equal beauty. Of Dr. Malcolm Sargent's conducting one can only complain that he shows a tendency to hurry : there is a savour in the contrasts of the overture that he tends to blur, but the finish and rhythym of the whole are admirable."